Jasmine is a 4 1/2 year old himi texel sow. 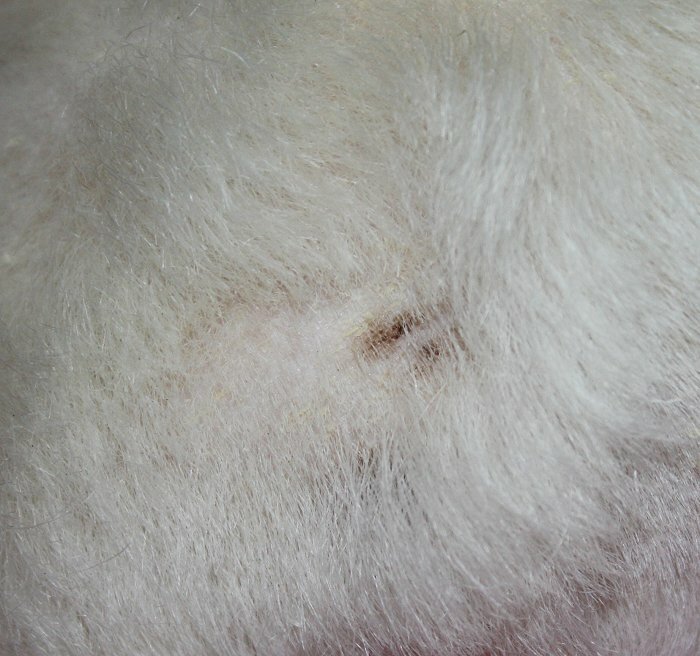 I did my annual shaving of the sheep yesterday and she has new (they were not there last year) dark spots on her back. One of them is HUGE. The others are small. There are about 4-5 of them. Should I be concerned about skin cancer? I have taken her out to events, but she has always been kept in the shade. Or can I chalk it up to age spots? Look closely at Bats pics. I would be worried if they are new. I believe irregularity and different shades of color are two warning signs (there are more but I don't remember them). I dug up Angel's thread in reference but the photo's are all gone. I posted in hopes that bats still has them somewhere to repost or send to me. I may have some on my computer somewhere. Don't remember if I asked for permission to add them to the forum but if that's okay with him and I can track them down, I'd be happy to. I don't remember any of these being there a year ago. The one on the left is huge! I'd take her to the vet without waiting for Bats, if it were me. Texels are a fancy breed and in my (admittedly very limited) experience, just like with dogs the fancier (read: more inbred) the breed, the greater the corollary weaknesses and predilection for problems of all sorts. 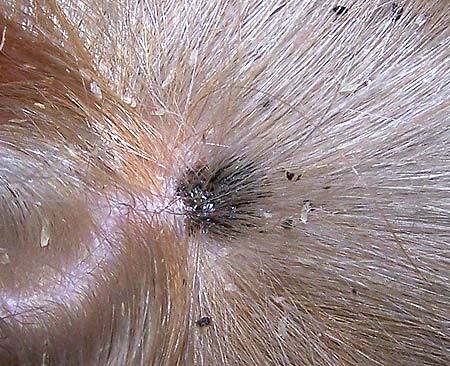 A mole larger than a pencil eraser (on humans) is supposed to be a warning sign. 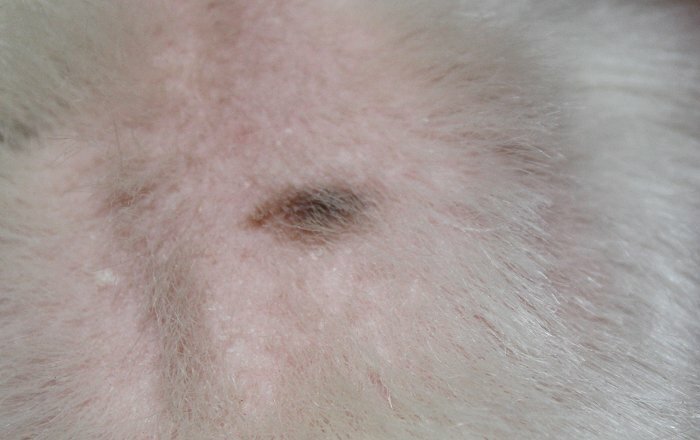 Melanoma in guinea pigs is quite rare, but I would still get that checked out by a vet. 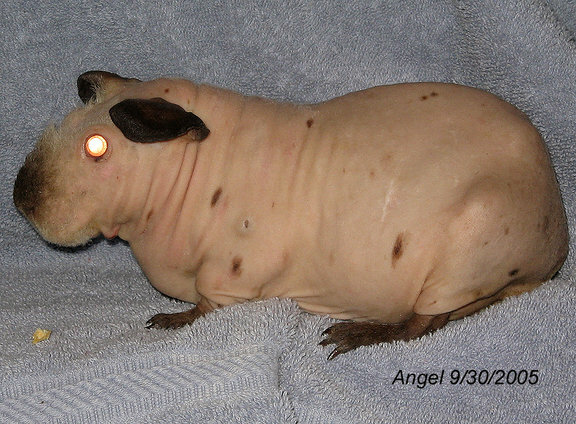 Aside from Angel and Stewart, I have heard of only one other case of (non induced) melanoma in a guinea pig. I hope it's just age spots. I'll schedule her to be seen. I hope it is nothing. Aside from biopsy though, how can we be certain what it is? Since she's a himi, she does have dark pigment and it could just be pigment. A biopsy is the only thing that I can think of that would let you know for sure. 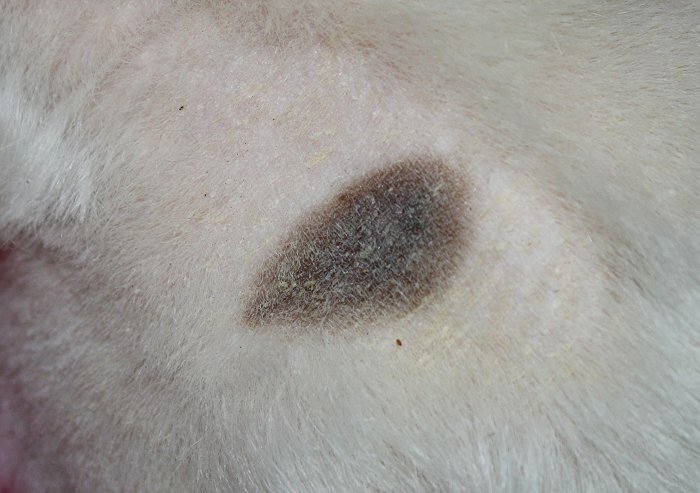 Unless your vet is so sure of him/herself that he/she thinks that a biopsy isn't necessary. My Skinnies sometimes change color/patterns as they age. I imagine that all pigs do, but it's not visible because of the hair. 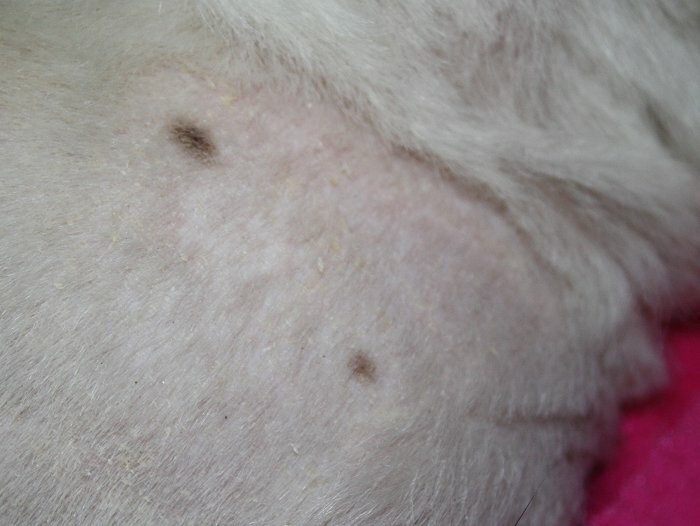 You wouldn't have known that these spots are there if you hadn't shaved her. She has gotten the dirty himi coloring coming up down her back in the last year. I'm crossing fingers for pigment, too. I think bats had biopsies done and surgical removals. I totally understand your concern, Erin. Skin cancer looks like a strong possibility. I take it you'd like these pics added to this thread? I only found one of bats' pics. Bats had some really good close ups of those moles that I think would be very helpful too. I don't think I have them but I found this pic. I hope he can track down the photos. I still haven't taken Jasmine in to be seen (shame on me), but there have been a few things of (what I thought) more importance pop up lately with vet expense and she got put on hold. 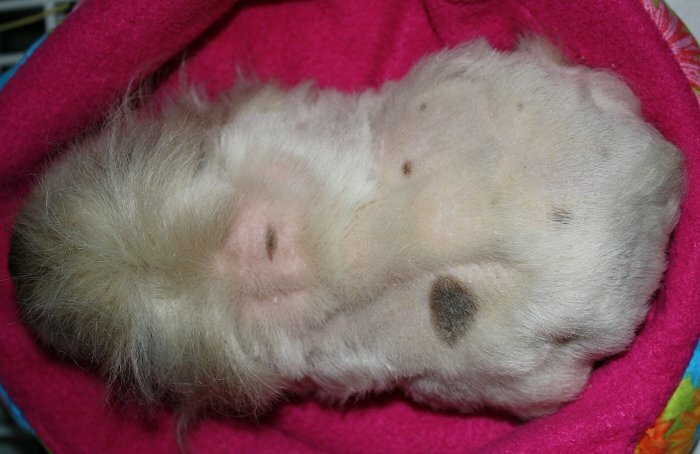 Anyhow, she started losing hair in a similar fashion that Little Pig did, around the face, neck and back of the head. I started ivermectin, and just gave them their third dose this afternoon. She doesn't seem to be getting any better, and now the hair loss is on her belly as well. So, I'm thinking not mites, instead something hormonal. Urgh. They know when we're broke, don't they? The pattern above does not seem hormonal to me. I still suspect skin cancer. Erin, I've had two with spots that developed and they were both fine. However, each only had one spot. The photo below shows Max's (he had a bad case of mites when I got him and had skin problems ongoing along with pneumonia at one point). I had Jasmine put to sleep today. In addition to cystic ovaries, she had a cluster of stones in her bladder causing her a great deal of distress. 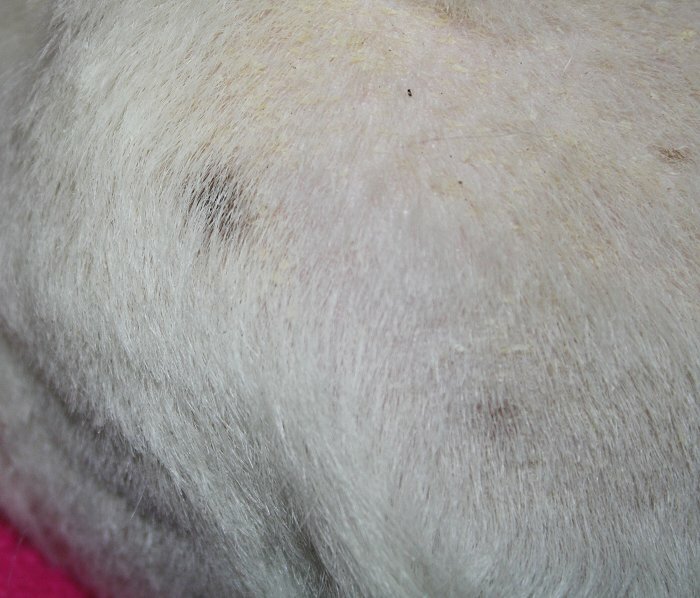 Vet wasn't concerned with the spots, thinks they were probably pigment. Though no scientific analysis was done.